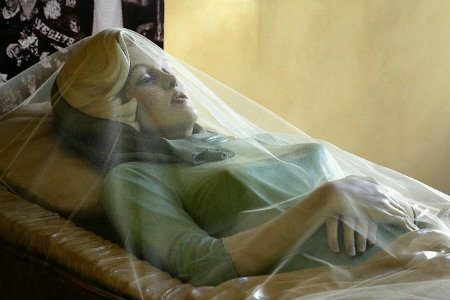 An image showing a deceased Marilyn Monroe in her funeral casket is an artistic recreation, not a real photograph of the event. 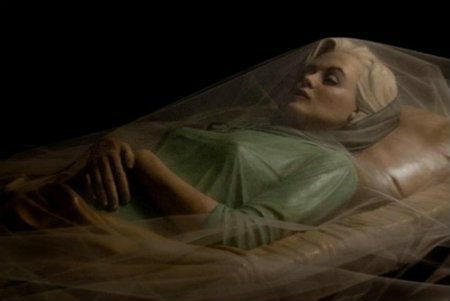 A photograph captures a deceased Marilyn Monroe at rest in her funeral casket. 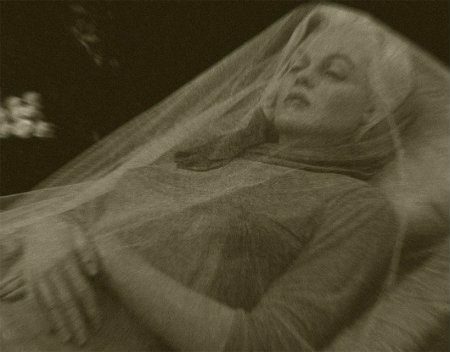 Even the most photographed woman in the world — such as an icon immortal Marilyn Monroe — there is a final image ending its short earthly parable and that could give meaning to this brief life. That’s why I wanted to represent it even as she rests in her coffin, in silence, finally at peace. The passions and sorrows of the world already so far away. A sleeping beauty contemporary vision that torments and delights at the same time. The enigmatic beauty of permanent abandonment. As beautiful in death as in life, the actress lay in an open bronze casket during the non-denominational rites, wearing a simple green sheath dress and a green scarf around her neck. In her hand was a tiny bouquet of baby pink roses put there by (Joe) DiMaggio. Los Angeles Times. 8 August 2011.